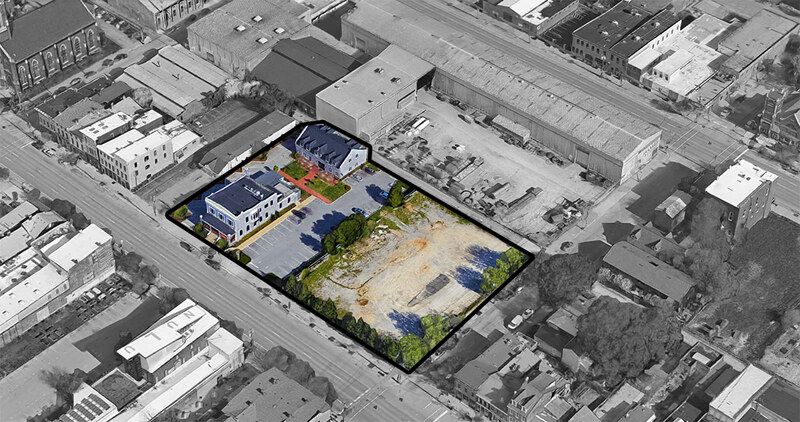 Plans for a new hotel at the center of Nulu are moving forward, according to Ron Turnier, president of Creation Gardens, the food wholesaler spearheading the project. Now, Turnier has shared new renderings and details of his AC Hotel by Marriott, set to take shape on the northwest corner of Shelby Street and East Market Street. Still, years after the project was announced, that lot at Market and Shelby is still a blank canvas. “I’m in the food service business, I don’t build many hotels,” Turnier said. He noted that there have been challenges to finding the right team, getting Tax Increment Financing (TIF) through the regulatory process, and timing to coincide with a major streetscape effort that will remake Market Street. Now, all the pieces are coming together. Turnier is partnering with Raleigh, North Carolina–based Concord Hospitality, which is developing AC Hotels in Raleigh and Pittsburgh. The design team is led by Chris Meyers of Columbus, Ohio–based Meyers & Associates Architecture. Louisville’s Steve Kersey, of Kersey & Kersey Architects, is working on the project locally. Nulu’s AC Hotel is slated 148 hotel rooms in the building’s main mass. A parking garage with 210 spaces is planned to the north along Shelby. 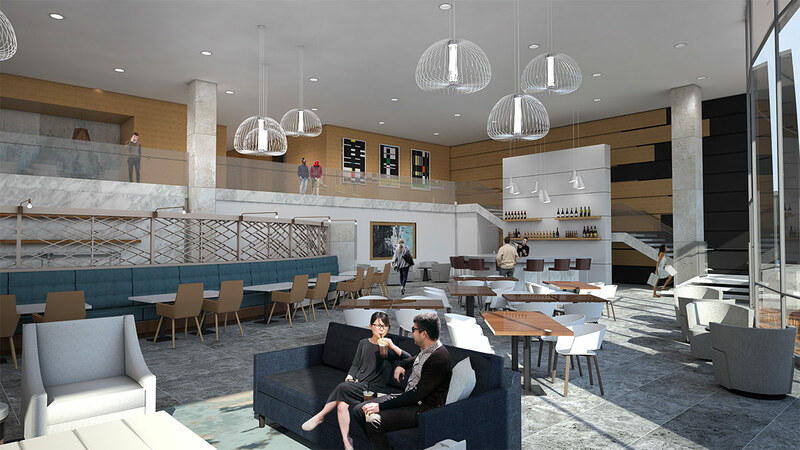 A 4,000-square-foot restaurant is planned inside the hotel on the corner and a lobby bar with mezzanine is planned inside. Plans for a rooftop bar have been eliminated. Turnier said he was happy to work with the AC Hotel by Marriott brand to create a boutique hotel for Nulu. “Right when we began searching for what to do, Marriott bought a Spanish chain of trendy hotels,” Turnier said. “It was their perfect answer to a kind of Aloft in terms of price point.” AC Hotels feature modern design with European influences and local flare, according to Marriott. Louisville’s AC Hotel certainly shows a higher level of refinement in its facade articulation than the typical hotel brands crowding downtown markets. 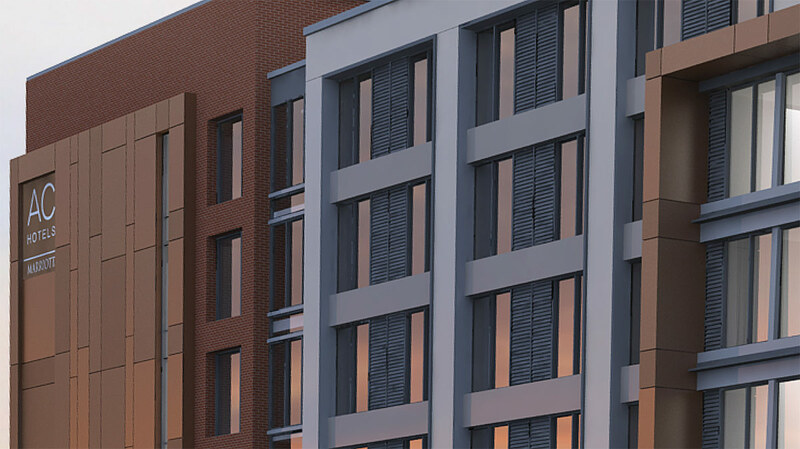 From renderings, the structure shows an earthy palette of brick and copper-toned metal panels with lighter pieces adding texture. A blocky mass on the structure’s west side notes the main entrance to the hotel beneath a port cochere. Large windows fronting Market Street show off the double-height lobby lounge and restaurant space. Turnier said a focus of the design was orienting the building to the street. Filling such a large void in the streetscape with East Market’s first new structure will have a profound impact on the feeling of the street. 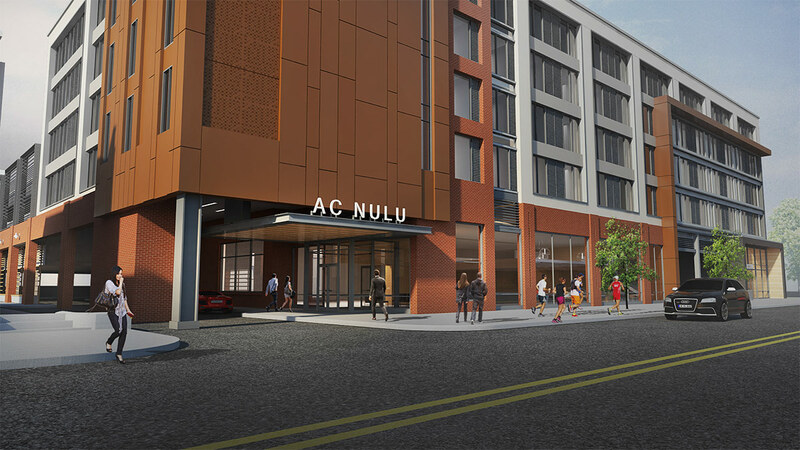 Simply by occupying an empty space, the AC Nulu will alter the neighborhood’s personality. This effect will be intensified with newly announced plans for a 272-unit, 5-story 700 East Main Apartments, proposed directly north of the hotel along East Main Street’s Service Tanks Block. Meanwhile, some 270 additional apartments are being built a block away at Main and Clay streets. There are still a few hurdles left for the project, including passing through the Nulu Review Overlay District (NROD), but Turnier remains as optimistic as ever. I love the positive review… Must be a friend of yours. Where is the normal, anti-automobile, anti hotel, anti development, nimby obstructionism we are all used to? Because this looks like the Cambria to me and this site bashed them. Glad someone actually figured out how to build a hotel without tearing down any buildings to do so. This one does look promising. Thanks for the review. And Jason – if you don’t know the differences in the projects that have caused widely varying reviews from Brandon, you’ve not really been paying attention to what this site is all about. Amen Matthew, Brandon on Broken Sidewalk provides great commentary and insight about Louisville urbanism, preservation, and development that’s being written nowhere else on the Internet. Sadly, in my mind with that comment Jason Hawkins just went from occasionally reasoned criticism even if I disagreed to being clearly a practitioner of intentionally obtuse trolling, the work of a sad man. Sad! Sorry to disappoint you, I will endeavor to troll harder and try not to make you so sad.